Glamping at Wyresdale Park with Featherdown Farms in The Lake District. Have you ever dreamt of stumbling on a secret garden? A child’s fantasy becomes reality at Chesters. Children will love the extraordinary, vast treehouse, plus a grass maze, mini animal-safari, fort with slides and climbing nets, and more just downriver at Born in the Borders. Then there is den building, following streams to the river, perhaps to fish, and a boat to use. From North or South, Edinburgh or Newcastle, this glorious Grade One listed Georgian mansion and Country Estate in Scotland is just an hour and a half’s drive. Chesters is full of delightful nooks and crannies, the magical old walled garden a true centrepiece. The estate is home to cattle, roe deer, pheasants, partridges and buzzards, and has a garden on the banks of the sparkling River Teviot with a run of salmon and brown trout to fish for, as an extra. Or order the fish served by the Gordon Ramsay-trained chef at the Chesters-owned local Ancrum Cross Keys pub. You can also yourselves cook up a delish slow-cooking meal on the wood burning stove, all pitching in for the most fulfilling result. There is no honesty shop at the campsite, but local shops are very close by. And Chesters has its own real ale microbrewery. John and Ellie’s efforts to rejuvenate the house and grounds were recently documented by the Channel 4 programme Country House Rescue. They view their ownership of Chesters as an enormous privilege, doing all they can to make sure the estate is viable and shared with as many people as possible. Born in the Borders has a stunningly renovated visitor centre, with a cafe and restaurant set in one of the estate’s old farm buildings. It is devoted to local produce in all its forms – everything from cashmere, to cheese and beer, even to boutique accessories. The prime attraction though is wondrous nature for wonderful glamping in the Scottish Borders. 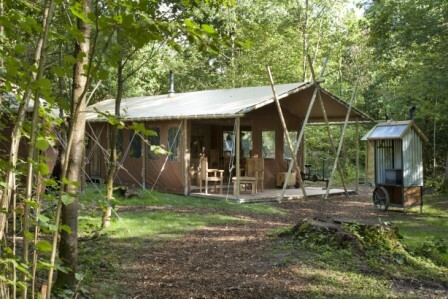 There is a CANVAS FRILLS LODGE WITH HOT TUB for up to 4 people also available. It is the same set up as the 6 person lodge without the cupboard bed.